A pellet stove is a type of stove that burns wood pellets. These small round pieces of fuel are purchased by the bag, then dumped into a hopper at the top of the pellet stove. These pellets are then automaticlly fed one at a time into a burn pot, which supplies air and vents the burned gases out. Pellet stoves need to cleaned and serviced regularly to keep them burning well. When they get too dirty, the glass on the door might even soot up. We clean the pipe to the outside, and also clean the inside of the stove. We can also diagnose and correct problems with the pellet stove itself. 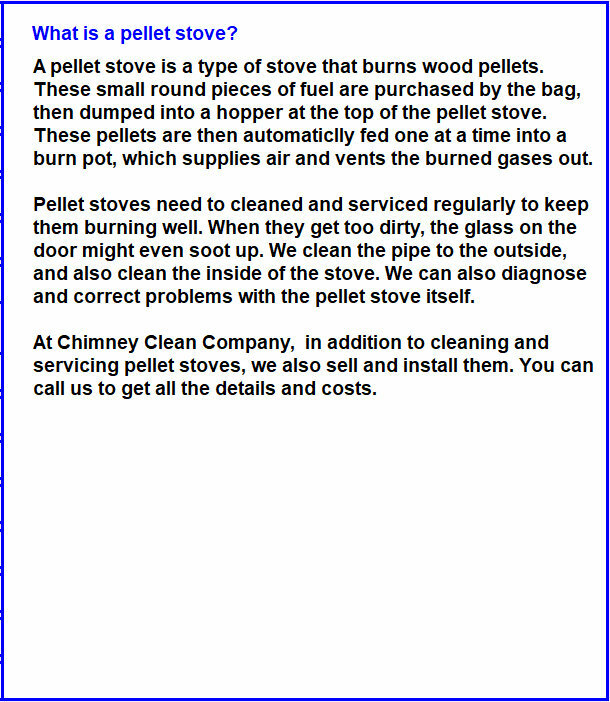 At Chimney Clean Company, in addition to cleaning and servicing pellet stoves, we also sell and install them. You can call us to get all the details and costs.